An interdisciplinary team of researchers from the Fraunhofer-Gesellschaft Institute has recently announced the completion of artificial skin produced in a fully automated process. Such a product could benefit pharmacologists, chemists, and doctors, who often have an urgent need for “skin models” – these can also be used to determine whether or not products such as creams and soaps are compatible with human skin. The need for artificial skin is derived from the extensive tests required for every new skin-care product in order to avoid irritation, allergies, and other negative reactions. Currently the demand for artificial skin is not satisfied, and the experiments’ expenses are growing due to the limited amounts of artificial skin available. “The production is complex and involves a great deal of manual work. At this time, even the market’s established international companies cannot produce more than 2,000 tiny skin pieces a month,” reports Jorg Saxler, who works with Professor Heike Mertsching on the Automated Tissue Engineering on Demand project within the Fraunhofer-Gesellschaft Institute. The production process is complicated, as it involves various biological and technological units. In a multi-stage process, small pieces of skin are sterilized at first. Then they are cut into small pieces, modified with specific enzymes, and isolated into two cell fractions which are then propagated separately on cell culture surfaces. The next step in the process combines the two cell types into a two-layer model, with collagen added to the cells that are to form the flexible lower layer, or dermis. This gives the tissue natural elasticity. 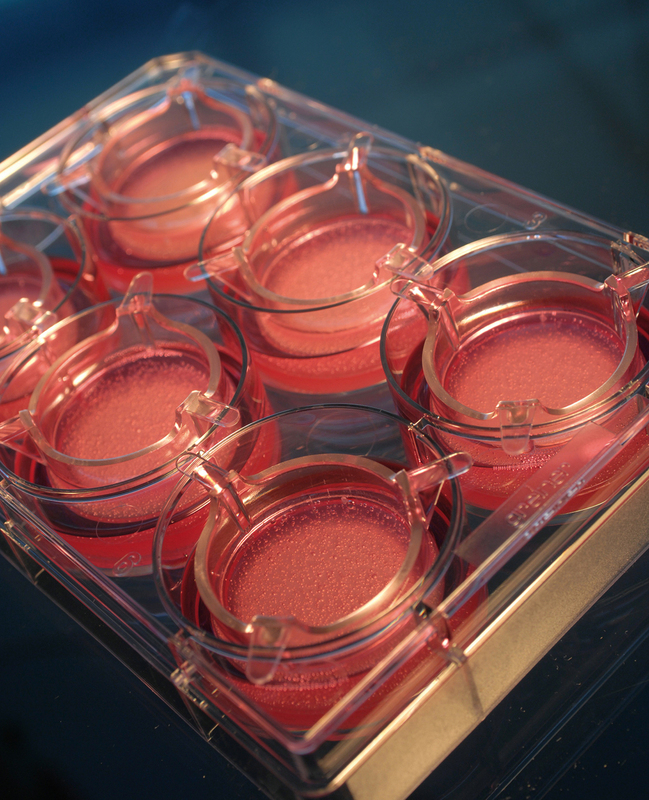 In a humid incubator kept at body temperature, it takes the cell fractions less than three weeks to grow together and form a finished skin model with a diameter of roughly one centimeter. The technique has already proven its use in practice, but until now it has been too expensive and complicated for mass production due to the extensive amount of manual work required. The project team consists of engineers, scientists, and technicians from four Fraunhofer divisions, who are cooperating and working at full speed to automate the work steps. Saxler, the head of technology management in the Life Science Engineering business unit, takes pride in their achievement. “Our engineers and biologists are the only ones who have succeeded in fully automating the entire process chain for manufacturing two-layer skin models,” he says. At a collective Fraunhofer-Gesellschaft booth at the 2009 BIO in Atlanta, the researchers are presenting a computer model of the overall system, along with the three fundamental sub-modules. The first module prepares the tissue samples and isolates the two cell types, the second proliferates them. The finished skin models are built up and cultivated in the third, and then packed by a robot. Though the presentation certainly is impressive, the researchers still have a lot of meticulous work ahead. The fine line between success and failure often depends on details, such as the quality of the skin pieces, processing times of enzymes, and liquid viscosities. Furthermore, the cell cultures must be monitored throughout the entire manufacturing process in order to provide optimal process control and to allow timely detection of any contamination with fungi or bacteria. “Our goal is a monthly production of 5,000 skin models with perfect quality, and a unit price under 34 euros. These are levels that are attractive for industry,” Saxler says. In addition to the chemical, cosmetic and pharmaceutical companies that have expressed interest, transplantation surgeons follow the developments in this area as well. Since they often require healthy tissue to replace destroyed skin sections, they can find this technology extremely useful. However, the two-layer models that are to be produced in the novel method are not yet suitable for such use. “They don’t have a blood supply, and are consequently rejected by the body after some time,” explains Saxler. The researchers have already begun to develop full-skin models which will include blood vessels. Once the research has been completed, fully automatic production of the transplants should also become possible. “We have designed the production system in such a way that it satisfies the high standards for good manufacturing practices (GMP) for the manufacture of products used in medicine, and so they are also suitable for producing artificial skin for transplants.” Mertsching says. TFOT has previously covered a technique to transform connective tissue into bone, accomplished by a group of researchers from Linkoeping University in Sweden. We have also written on the ability to see with your skin, researched by Professor Leonid Yaroslavsky from Tel Aviv University. Other related TFOT stories include the development of artificial skin for robots, designed to improve autistic children’s abilities to communicate, and the skin patch replacement for traditional injections jointly developed by HP and Crospon. For more information about the research of artificial skin at Fraunhofer-Gesellschaft, see the institute’s press release.